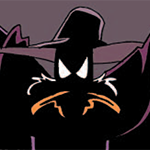 The Old Haunt: A Darkwing Duck Forum Main Menu Negaduck's N00b 101 Hello! (12-04-2018, 04:28 AM)Ghost Cat Wrote: Welcome and salutations, Daffytitanic. I am Ghost Cat - roleplayer, writer, Uber driver, and part-time web designer. Its always an honor to meet a fellow Darkwing fan online. Do enjoy your stay here on the Old Haunt and I hope you're having a splendid holiday season. Hey, Great Demon Queen (if you're reading this), love what you've done with the place! The updated version looks fantastic! Thanks! I like to join communities relating to something I'm a fan of. I had a big fanfic idea as some graphic novel but, haven't go around to it.